After fans spend a long afternoon watching baseball and eating nachos on a stick, the Brewers know they need a nice desert to cap off their day and that is why they are rolling out a new sandwich that features peanut butter, jelly and frozen custard between two doughnuts. After fans spend a long afternoon watching baseball and eating nachos on a stick, the Brewers know they need a nice desert to cap off their day and that is why they are rolling out a new sandwich that features peanut butter, jelly, and frozen custard between two doughnuts. The treat comes from Milwaukee's Holey Moley Coffee & Doughnuts, which is providing an array of new treats for the park, including a pulled pork sandwich on a doughnut—cleverly called a Ham Dinger. 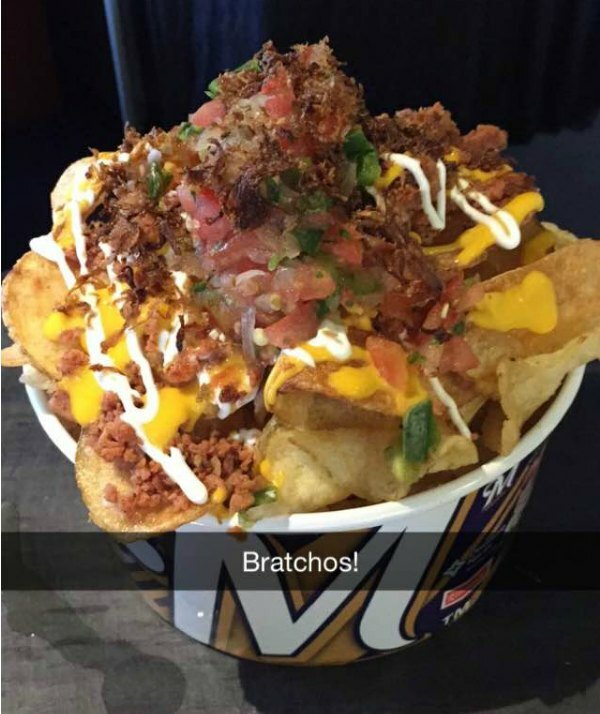 The Brewers rolled out the new Miller park menu on Thursday on the team snapchat account, showing off the aforementioned delights as well as Brat-chos, a potato chips, bratwurst and beer cheese combination that is also quite popular at Lambeau Field.